10am – On my way to my midwife appointment, I had an amazing healthy sprouted french toast plate from Uprooted Kitchen in Gilbert. If you haven’t been there, you NEED to go btw. Sprouted grains, probiotic drinks, healthy desserts galore! The owner said to me when I ordered, that a lady had ordered it the week before then went into labor that day. Uhhh yesss pleeeeeease! 11:30am – Normal midwife appointment but since I was 42 weeks they did an ultrasound. Everything looked perfect! Except… they found some fluid surrounding Kora’s heart. My midwife sent me to the NICU hospital to get a second in-depth ultrasound done and have it looked at by a doctor. I was terrified I had no idea what that meant for the crazy-health-freak/doctor-google-queen. I called Troy crying and paranoid that I’d have to get a C-section or something bad would happen to the baby. The ultrasound tech said my placenta flow was beautiful. I thought that was cool. 42 week old placenta going strong! Did you know placentas get old!? They have a really short organ life.. Random fact for the day. 12:30pm – I was taken back to triage to wait. The nurse came in and put a monitor on me to measure any contractions I may had been having. I was having tiny ones but they we’re all over the place, sporadic with no consistency. She said that I was probably dehydrated. Hooked me up to some fluids and within minutes, they were actually consistent but still no worthy signs of progress. Troy got to the hospital and the doctor came in and gave us the news. What the… this was SO NOT my plan. At all. I had just gone for a check up this morning, found fluid about baby’s heart, sent to the hospital where I wasn’t going to give birth, told I couldn’t go home but I was going to be induced. I kinda lost it at that point. “Troy, we’re having a freaking baby tonight..” we both tearing up with that warm feeling but a little terrified and nervous for baby girls heart. And for me complete fear because nothing was going the way I had thought. Troy left the hospital to go home and grab the bags and snacks I had packed for whenever Kora decided to come. While he was gone the nurse did a cervical check on me.. for those who don’t know what a check is they, quite frankly, put 2 fingers in and measure how wide your cervix is open and how thin it is to prepare for birth. She said I was at 3cm and 90% effaced. Which is guess was pretty good. Within like 20 minutes my contractions began to get stronger and closer together. 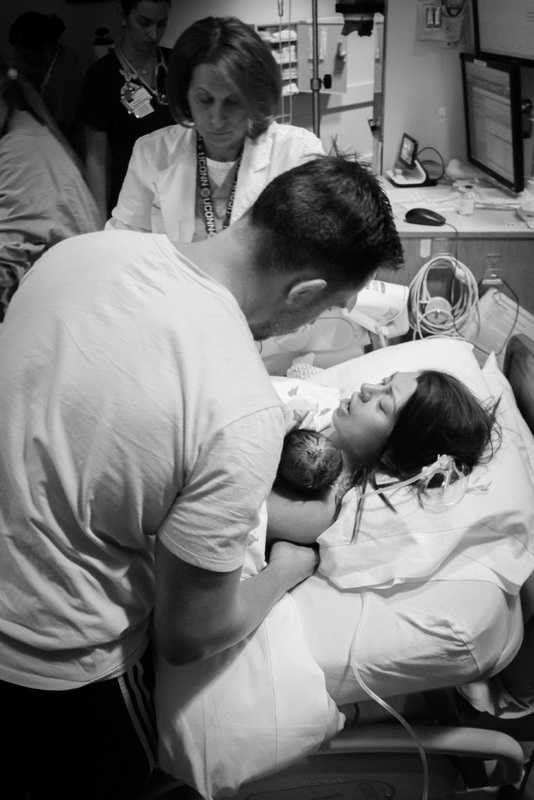 9pm– They wheeled me up to my room in the labor and delivery, I met my birthing nurse Rachel. Who rocked. I set up my diffuser with lavender, had my Bluetooth speaker ready for whatever my heart desired to play during birth. I actually made like 5 different playlists just in case. I had planned to dance through tough contractions to some hip hop and salsa! We turned on the Oklahoma vs. Utah playoff game. Troy is from OK, I’m from UT. The Jazz won and the Thunder were eliminated, nbd. Rachel, knowing that I wanted to go all natural and that my plans were all messed up, told me that we could go the least intervened way to get things going. She said we were going to do prostaglandin gels that soften the cervix, 3 different times to see how that progresses, then pitocin. 10pm – Got gelled. We chilled in bed for an hour, then Troy and I walked around the hospital for about an hour. By the time we got back I had already gotten to 5cm and I was at like a 2, 3 maybe, on the pain scale. She said I was moving along fine and that I wouldn’t need anything else unless I stopped progressing. Troy and I figured we should probably sleep since we knew that first labors are usually lonnggggggg. We had a marathon ahead of us. 2am – Contractions woke me up but nothing too bad. I just had to take some deep breaths and was able to fall back asleep. Then came about 3:15am. I woke up with what I thought were #2 cramps.. nope! I got up and tried to go to the bathroom but this was different. It got real at that moment. I was hoping it was just poo cramps, a little bit of fear started to set in and knew there really wasn’t a way out but to get through it. I walked around my room in the dark, having to stop and breathe when a contraction came. I kept saying to myself.. I seriously felt so peaceful in that moment, spiritually and emotionally. 4am – The nurse came in and checked me.. 8cm and 100%! Holy. Crap. Rachel called the doctor to give her a heads up that I was going to be pushing soon. I was pretty stoked though, with the pain level I was expecting to be maybe a 6 or 7cm! I called my doula, not knowing I was that far along and she was on her way. My doula got there right before I was starting to push. Then my dad walked in! He didn’t even know I was going into labor. All he knew was that I was at the hospital waiting to get induced sometime or another. He couldn’t sleep so he just decided to come on down to the hospital, and he was just in time. I reached 10cm, dad left the room, I tried getting on all 4s – nope. Oh, all that position practice for weeks at home. I laid on my side, with my doula holding up my leg, and Troy holding my hands. I was content. It’s so amazing being able to feel what your body is doing on its own during a contraction. You can feel your uterus actually begin to push out the baby and you get this undeniable urge to push. Kora was facing up since 32 weeks; I did all the stretching and positions to get her to flip but didn’t work. Before she began to crown, I felt her move. The little one flipped and was in perfect position. “When a contraction starts, I’m going to count to 10 and you’re going to push as hard as you can for those 10 seconds”. I swore I was not going to be forced to push but to let my body do it’s thing when it wanted to do its thang. Part of me wishes I would’ve kept that promise to myself. People get all impatient when the baby’s head comes out during a contraction, then back in during the break. But it’s actually good because it aids in bringing blood to the tissues and helps with stretching – hence, not tearing. Then came the “ring of fire”, apparently that’s a thing. Daaaaang. Contractions were nothing compared to crowning. Troy moved to holding my leg at that point so he saw EVERYTHING. “Holy cow she has tons of hair!” We joked about her being a troll baby.. lots of jokes during pushing made it easier actually. When I thought I was going to be one of those wives who punch or scream at their husbands for making jokes during labor. Nope! Things were going good, though the firing ring was ouuuuuuch! But then the monitor started beeping – baby’s heart dropped super low. A bunch of nurses and doctors ran over to me. Flipped me on my back, put my feet in stirrups, strapped an oxygen mask on me and said we need to get this baby out of here! Wasn’t fun and games anymore. I started crying and begging God that my baby was going to be okay, I was so scared. The doctor put her fingers inside and stretched me to the table! I about screamed. I was begging her, to please stop that it hurt so bad and I couldn’t even push with her doing that! Protective Troy told her to stop, and she barked back at him, “Let me do my job!” pretty sassy and rolled her eyes. My doula was shocked. Man, I REALLY wish I had my midwife at that point. Within about 15 minutes of some serious pushing with everything I had left in me her head was out. The cord was wrapped around her neck twice and they had to cut it for her to come out. Delayed clamping – out the window. But it’s all good for safety of baby. Another couple pushes, I got this strange slithery slippery feeling and my stomach just deflated! She was out and put straight onto on my chest! The little wiggle worm that’s been kicking my ribs, hiccuping constantly, partying in my belly every night at 11pm was finally on the outside! It that moment, you realize and are grateful for how amazing your body is for creating and housing this little cute creature. She immediately latched on great, she definitely knew what she was doing better than I did. I still remember those big eyes staring up at me when she nursed for the very first time. You wonder how you could ever love someone so much with only a moment of meeting them but then again they were inside you for nine months! After that golden hour of her on my chest, they took her to do a cardiogram scan on her heart – it all turned out to be okay! I learned many lessons during all of this Mainly, to let go of my plans of labor and delivery and surrender to the best way it could have happened. Despite all the craziness, stress, lack of control, not knowing that a midwife appointment would turn into labor – I was able to have a natural labor without pitocin and an epidural, and above all else – baby Kora is super healthy, strong, smart and a super snuggler! We love our baby girl!